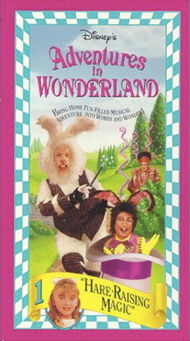 Adventures in Wonderland first aired in 1991, and ran on until 1995, finishing a total of 100 episodes. The show was nominated for an Artios award for best casting in 1992, along with a nomination for a Daytime Emmy in 1996 for Outstanding Costume Design, and also was nominated for a Humanitas Prize in the Children's Live-Action category. The show won 6 Daytime Emmys : for Outstanding Achievement in Makeup and Outstanding Directing in a Children's Series (1996); for Outstanding Achievement in Costume Design (1995); for Outstanding Achievement in Makeup, and Outstanding Writing in a Children's Series (1994); and for Outstanding Achievement in Hairstyling (1992). The show's youngest star Elisabeth Harnois (Alice) also recieved an award, a Young Artist Award for Outstanding Performers in a Children's Program. Sure, the award-winning mumbo-jumbo and the lessons the show taught children made parents proud to say their children watched the show ... but to the kids, it was all about the show in it's entirety. Kids didn't love it 'because it won awards'. I didn't even know that back then! Kids remember the show for it's lovable characters, it's funny jokes, it's goofiness, it's songs, it's colors ... everything! I mean, what kid doesn't want a place to escape to? I know that's all I ever wanted to do (and still do.) The show creates a sort of unexplainable magic to it that makes it possible for both children and adults alike to enjoy watching it together. 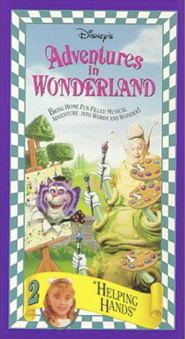 After Adventures in Wonderland went off the air in 1995, Disney released three tapes (with 2 episodes in each) of the show, leaving only six episodes available for fans to own. These tapes can still be purchased through either Amazon or eBay. Tape 1 is "Hair Raising Magic", one which I own. It consists of "Off the Cuffs", an episode where the Hare's magic trick goes wrong and the Wonderlandians wind up handcuffed to eachother until Hare can uncover the key. The second episode on this tape is "For Better or Verse", where the White Rabbit suddenly can't help but rhyme whenever he speaks, and it turns out to be contagious. Tape 2 is called "Helping Hands". It includes the episode "Pop Goes the Easel", where the Queen's official portrait is to be unveiled and the White Rabbit trips and puts his head through the canvas. The Wonderlandians help in attempting to restore the painting before the Queen can find out. The second episode is "TechnoBunny", where the White Rabbit is replaced while on vacation by a robot to do his work. The robot is so efficient that it looks as if the White Rabbit may be out of work permanently ... until the Queen's failure to follow directions causes a surprising malfunction. Tape 3 is called "The Missing Ring Mystery". It features the episode "Pretzelmania", where the White Rabbit winds up dropping the Queen's diamond ring into the Hatter's new pretzel machine. The Wonderlandians help to pig out on the 100 pretzels to find it before the Queen finds out what they've done. The second episode on the tape is "Noses Off". While trying to help Her Majesty come up with an original costume for an upcoming masquerade ball, the Hatter and the Hare accidentally attach a ridiculous rubber nose to the Queen's face and they can't get it off! 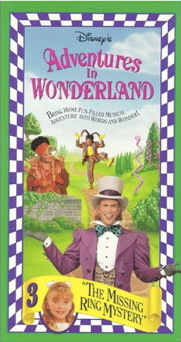 To watch episodes of Adventures in Wonderland, please visit Mel Pierson's youtube account here.